← “Stock Footage” Finalist for The Chariton Review Short Fiction Prize! 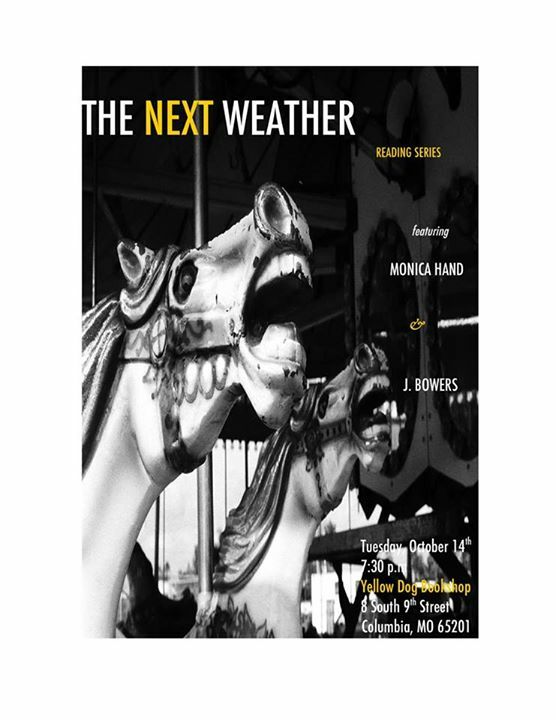 I’m pleased to announce that along with the incredible Monica Hand, I’ll be reading at Columbia, Missouri’s own Yellow Dog Bookshop at 7:30 p.m. on October 14, 2014 as part of THE NEXT WEATHER reading series. Monica A. Hand is a poet and book artist currently living in Columbia, MO, where she is pursuing her doctorate in poetry at the University of Missouri. Her poems have appeared in Black Renaissance Noir, Drunken Boat, African-American Poetry for the 21st Century, Gathering Ground: A Reader Celebrating Cave Canem’s First Decade, and elsewhere. She earned a combined MFA from The Drew University MFA Program in Poetry and Translation and is a founding member of Poets for Ayiti. Her book of poems about/to Nina Simone, Me and Nina, was published by Alice James Books in 2012.